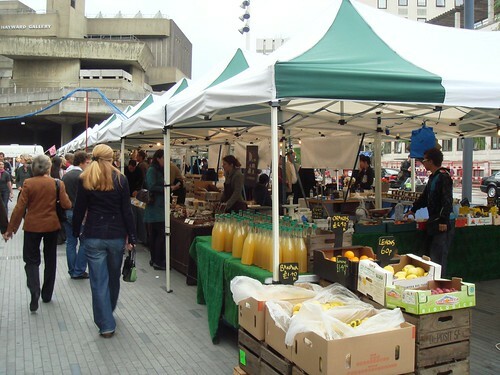 The Summer Market at the South Bank Centre is meant to promote Slow Food. 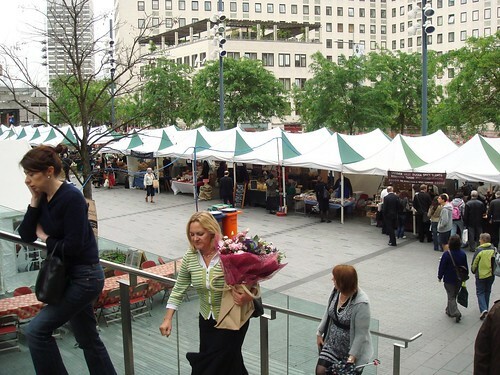 It's held every so often as part of the Summer Series of Slow Food Markets at Southbank, including this weekend - next one in July. The weather had definitely turned, but this wasn't going to stop me from dutifully pootling along after work on Friday. I did a quick circuit first, eyeing up the various goodies to calculate the order I should buy things in (heaviest and perishables last) and then went round again at leisure. The first thing I saw was a little marquee by Rocket Gardens with lectures on how to "grow your own". They also had their own stand selling baby plants for you to rehouse in your own gardens run by a very nice lady. Talking of which, not everyone running the stalls was quite so nice. 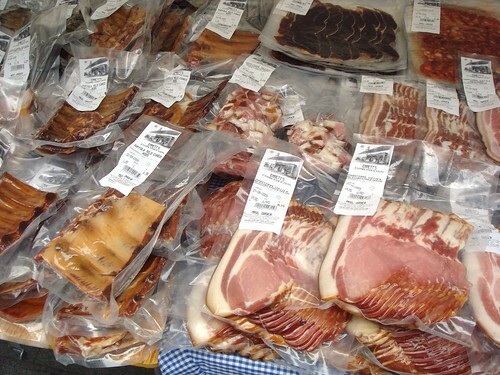 Something that's been bothering me for a while now is that a lot of people who sell at farmers' markets won't offer me any samples or even look at me, but they'll readily force their spiel and produce on others. 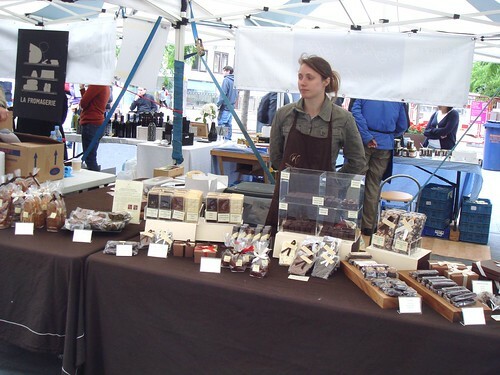 If I'm one of two people standing at a stall, time and again the stall-holder will slice off a bit of chorizo or piece of brownie and give it to the other person but not to little old me. I can't think why this is - I'm not pox-ridden or particularly unattractive - but it is actually beginning to wear me down somewhat. Perhaps they think I'm a tourist and unlikely to buy anything (I suppose I am Oriental and wield a camera) but that doesn't excuse open rudeness. 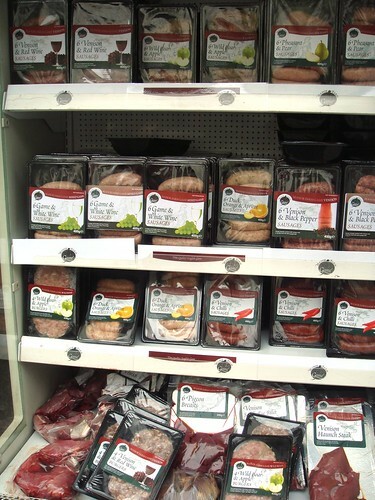 An example: there were two men running the Manor Farm Game stall - one was bearing a platter of sausage chunks and was proffering them to all and sundry, but whenever I meandered past or stopped to look at their wares or even looked right at him, he blanked me and swerved away (in fact at one point, he pushed right past me to offer a sausage to the person standing directly behind me). Thankfully the second guy was really lovely; he approached me first and happily sold me a brace of pigeons and a wild rabbit, upon which I turned to the first guy and took some sausage anyway as if to say "Look, I'm a frigging customer - I deserve some food!" He still looked kinda affronted. Bah. 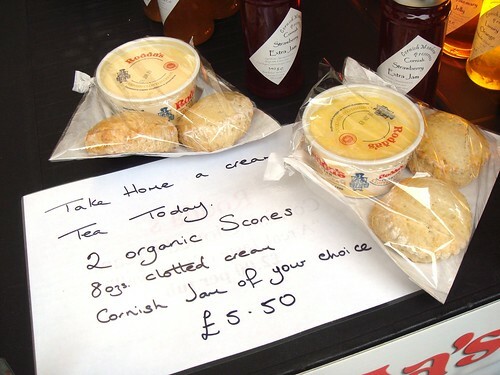 Anyway, the lady selling Cornish Meadow Preserves and Rodda Clotted Cream Teas was incredibly sweet and made up for it. She seemed quite pleased I was taking pictures of her produce and when she realised my hands were full of cheese, she kindly picked the jars I wanted from her shelves and put them in my jute bag for me. 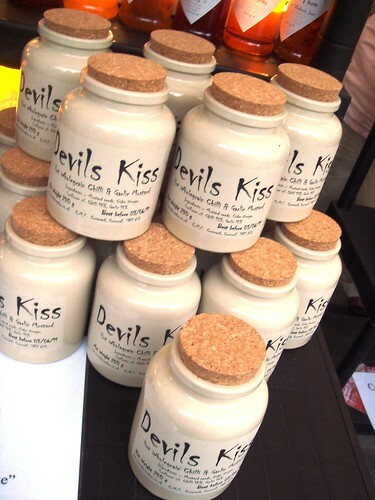 She also had Grumpy Old Man and Devil's Kiss Mustard in lovely earthenware jars - by far the prettiest stall. 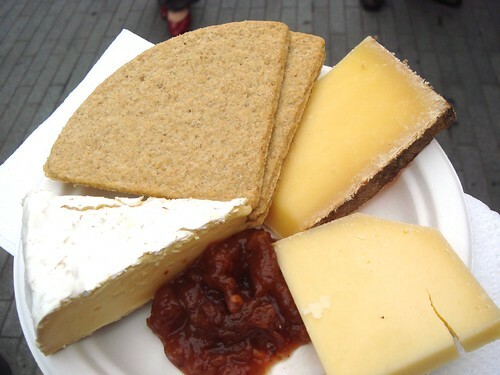 The cheese that hampered me was from a wonderful little Welsh Cheese stall (sadly I forget the name) which had a fab deal of a fat cheese plate with oatcakes and luscious chutney for only £3.50. 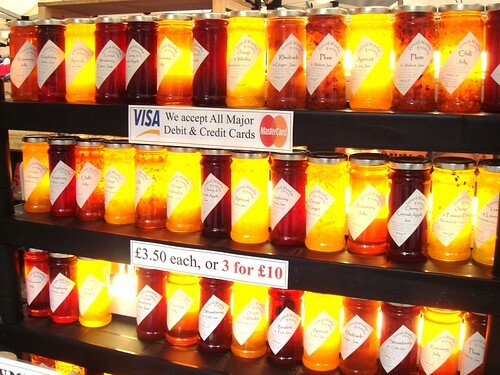 Even better, they told me that I could have free top-ups of oatcakes and chutney. Now that is what I call service. 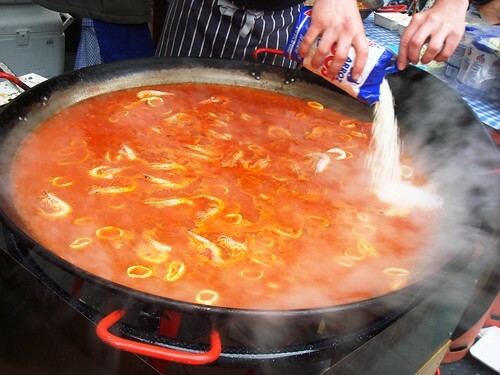 The market had the usual giant paella stall and chocolate stalls and olive oil stalls etc. 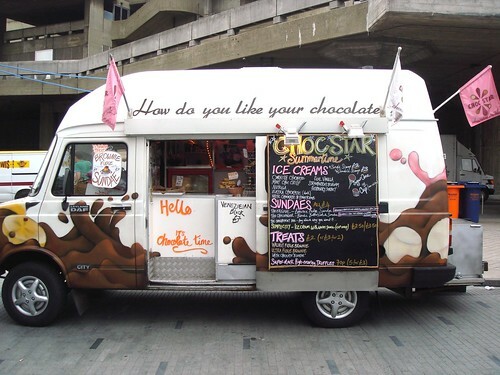 I even spotted the fabled Choc Star van, but I'm vaguely on a diet and couldn't really justify buying a giant sundae. 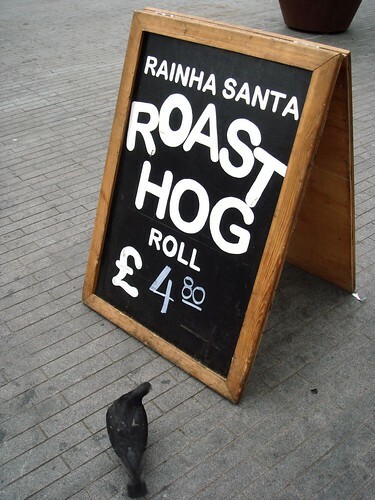 I also passed by Rainha Santa's hog roast. 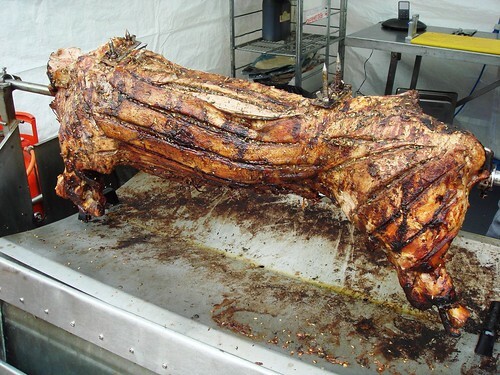 I absolutely adore the idea of a hog roast, but the portions you get in baps for £4.80 seem too stingy - and my ambition in life is to eat a whole roast boar with my hands like Obelix. 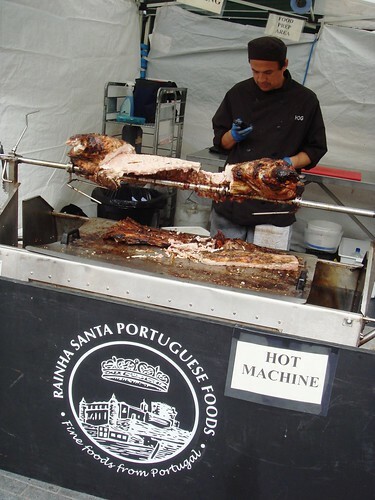 Also their hog roast reminded me a bit too much of Pinhead. Woodwards Farm was run by a charming couple (their website is super-cute) who were selling more unusual cuts of beef at real credit crunch prices - I picked up picanha steaks, tail fillet, chump and feather steaks. We had the picanha steaks that evening and they were deeply flavoured, juicy and tender - and required barely any cooking. 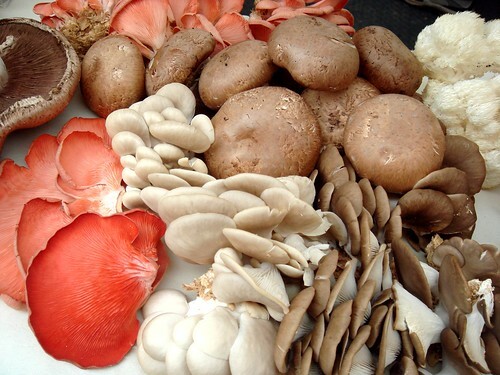 There was also a mushroom stall (again, can't remember the name) selling numerous gorgeous-looking mixed boxes, as well as starter kits to grow your own. Emmetts of Peasenhall (fab website name www.ebacon.co.uk/) sold various bits of porky goodness - I filled my bag with smoked ribs and bacon and offcuts, some of which were "black" ie sweet pickled in Guinness and spices - can't wait to try it. I later found out that they're one of Rick Stein's Food Heroes. 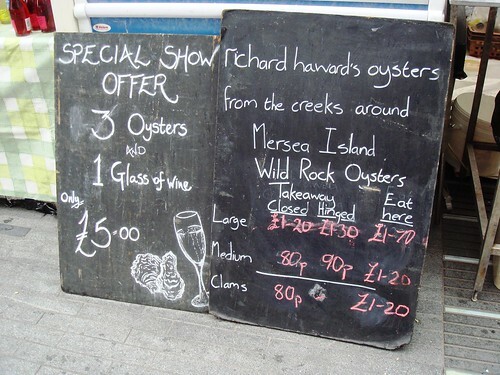 Best till last though - I came upon Richard Haward Oysters, a real jewel. Richard Haward and his wife own the Company Shed on Mersea Island - I'd met the man himself at the Real Food Festival last year and his shellfish was outstanding. 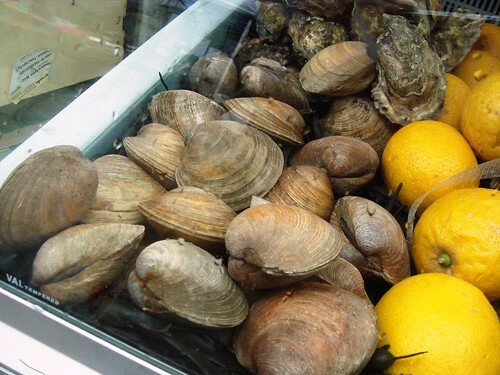 Today they were doing a deal of three oysters and a glass of wine for £5 which is all fine and dandy but I don't actually like wine (horrors), so instead I asked for six large rock oysters and six giant clams to take away. 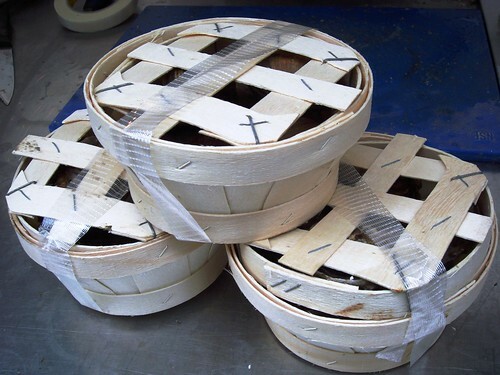 The very charming stall-holder packaged them up in cute little baskets for me and I took them home for my tea. 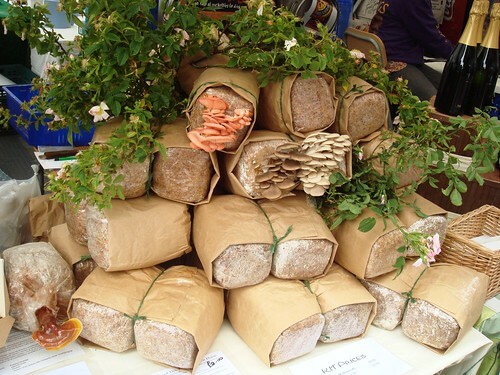 The mushroom starter kits were very cute - I wish I could remember the name of the stall!